The Lunar and Planetary Institute (LPI) invites inquisitive adults interested in current topics in space science and exploration to join us for the next presentation in the 2018–2019 Cosmic Explorations Speaker Series. 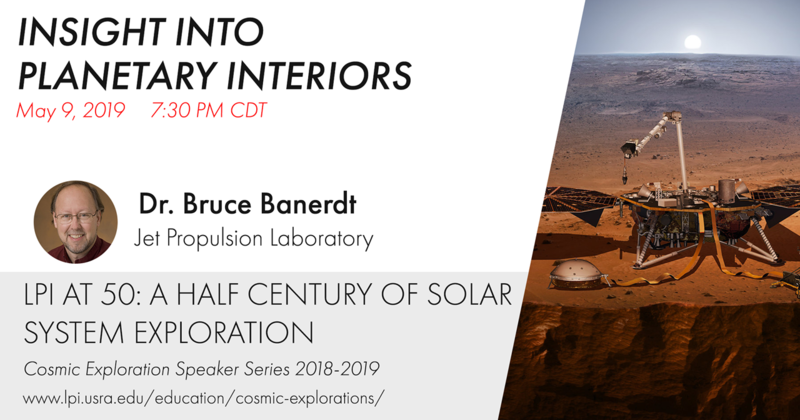 Dr. Bruce Banerdt from the Jet Propulsion Laboratory will present “InSight into Planetary Interiors” The presentation will be held on Thursday, May 9, 2019 at 7:30 p.m. at the Lunar and Planetary Institute in Houston, TX. The Cosmic Explorations Speaker Series features some of the hottest topics in our solar system and beyond with the scientists who are making the discoveries. Dr. Banerdt is the Principal Investigator of the InSight mission and studies the formation and evolution of Mars. The 2018–2019 series, “The LPI at 50: A Half Century of Solar System Exploration”, examines how our understanding of the solar system has changed greatly in the past 50 years. What was known about the solar system 50 years ago? How has our knowledge evolved in that time? How are planetary missions contributing to our evolving view of the solar system? For those who are unable to attend, the presentation will be streamed live through the USRA Ustream channel. Recordings of past presentations are available on LPI’s YouTube channel. November 15, 2018 – Dr. Fran Bagenal, University of Colorado – Boulder, NASA’s Juno Mission: What’s New at Jupiter?